Assistant police commissioner Abdul Baten told reporters on Sunday that S.M.H.I. Faruque and Tasvirul Islam, who is a district leader of the opposition Bangladesh Nationalist Party in Dhaka, were arrested for negligence and violations of a national building code that resulted in casualties. The city’s housing authority said the five upper floors in the building were illegally added without official permission. 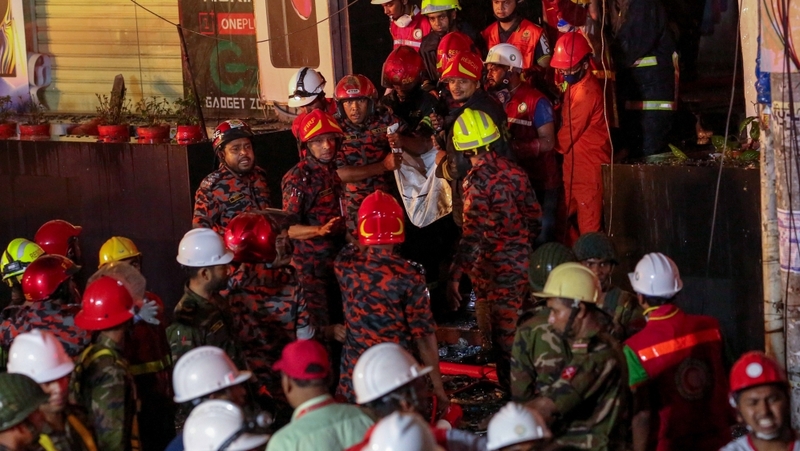 Fire officials said the blaze-hit building on a busy avenue in Dhaka’s Banani commercial district lacked fire exits and sprinklers, while access to its emergency staircase was padlocked. Shahjahan Shaju, additional deputy commissioner of the detective branch, told The Associated Press news agency that Islam was the owner of the top three floors that had no permission for the construction and Faruque was the land owner of the complex. “Definitely this is murder. It is not an accident… Nobody will escape the law,” housing and public works minister Rezaul Karim told reporters on Friday.